This part of the exhibit features quotes from various sources showcasing the complex history of North First Street and the cultural life of the community. We welcome more memories and more images. Please contribute your memories and photographs by clicking Contribute. "The thing I like most about this place is the people. Talking with other black men about fathering, religion, things like that...The building itself doesn't hold a lot of memories, but the atmosphere does." Urbana firefighter Phillip Edwards on the importance of Rose & Taylor's Barbershop, on its move to 124 N. First Street. Quoted in "Rose and Taylor barbers making move," News-Gazette, June 24, 2000. "Just east of the Illinois Central Railroad tracks in the early 1900s was a triangle shaped area bounded by First Street on the east and Water Street on the west that contained businesses owned by members of the black community. They included restauntnts and a pool hall. The Harris and Dixon Taxi Cab Company was located in this area as well and catered primarily to women who were cooks on the campus of the University of Illinois. 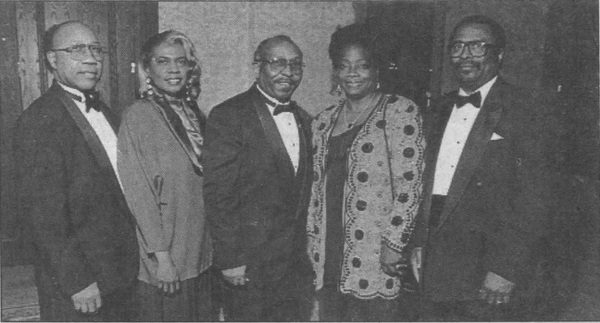 These women had to be on the job at very early hours in the morning; however street cars were usually available to them in the evenings when they returned home from work," Erma Bridgewater article on Black Owned Businesses in "Through The Years," Spring/Summer 2000. "At one time there was not a single black business on First Street. As the white business owners pulled out, the blacks pulled in," George Pope, on the development of North First Street as a "black downtown" in the post-World War II era. 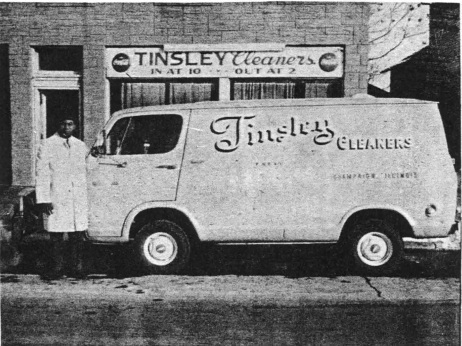 Quoted in "Black-Owned Firms have Rich History," News-Gazette, February 26, 1995. "Growing up in northeast Champaign... I remember some restaurants... Holt's Restaurant on North First Street, Larry's on North Fourth Street, Dagwood's on North Fourth Street, Beasley's on East Main Street, the Chick-Chick Shack on North Water Street - then it moved to North First Street, Banks Bar-B-Q, on East Washington Street, Hickory Pit Bar-B-Q on North First Street, Mary's Place on East Washington Street, and in the summer months there were temporary Bar-B-Q Pits in screen houses - with the smell of Bar-B-Q in the air all summer long." Kathleen Slates remembering her childhood on the Facebook page, "You Know You Grew Up in Urbana-Champaign if You Remember...", posted December 26, 2009. "Ace Barber Shop was owned and operated by Arthur C. Merrifield. It was first on University Avenue and later moved to North First Street. He had three chairs. His nephew, Fred M. Merrifield, operated the shop after his death until 1972. Many barbers, including Speedy McDowell and Roy Suggs, apprenticed themselves to Merrifield and Lincoln Wesley and later took barber exams, passed the state boards and opened shops of their own. 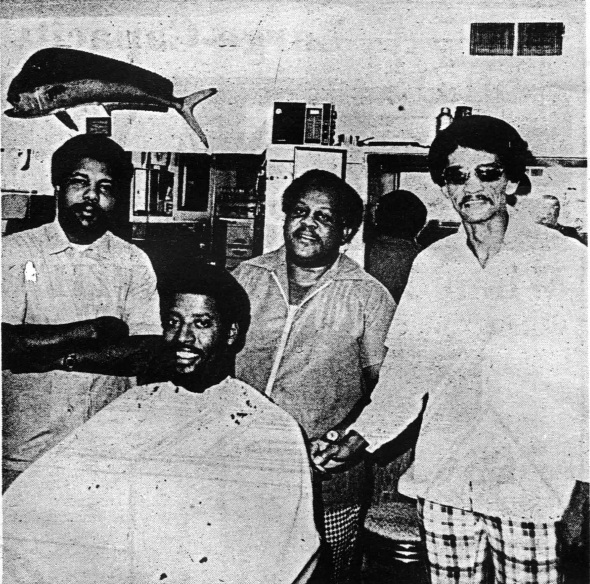 The older barbers passed the art of barbering to the next generation," Estelle Merrifield in the News-Gazette special supplement for Black History Month, February 19, 2001. "I think the city misses [Wardell Jackson]. 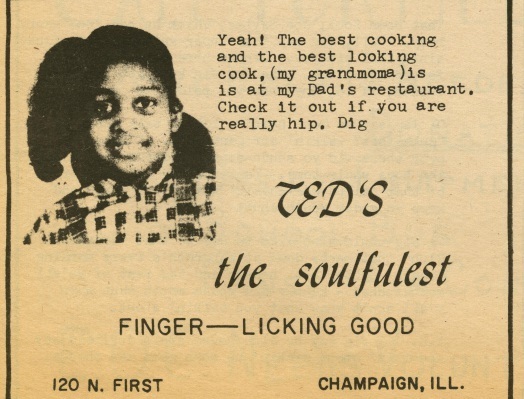 He was sort of a shining light in north Champaign." J.W. Pirtle, remembering local landowner on North First Street, Wardell Jackson. Quoted in "Black-Owned Firms have Rich History," News-Gazette, February 26, 1995. "This project will have no value if the area is not retained, owned and managed by the people of that neighborhood." Activist John Lee Johnson, on the necessity of keeping North First Street in the control of the local African-American population while revitalizing the area. 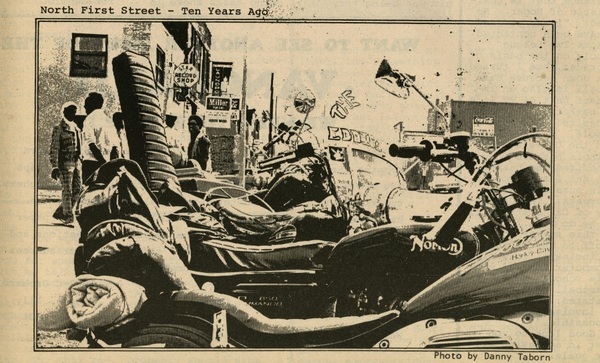 Quoted in "Champaign Set to Act on N. First Street," News-Gazette, November 5, 1997. "This community was segregated. African Americans began to build their own businesses because they weren't gainfully employed. The whole community was thriving with different businesses....During the '70s and into the '80s, you began to see these businesses vanish. As integration became possible, African Americans were able to move out of the African-American community and into the community at large. If it was being offered somewhere else, those services in the black community could be drained off." Ted Adkisson. Quoted in "City Grants to Boost North First Street Development," Daily Illini, 2004. "There was a club called the Inner Circle, just north of where the Cattle Bank is now, and there used to be the Rainbow Tavern, south of where the barbershop is now. In the '50s they used to have jazz and blues at both places. When Main Street used to run under the viaduct ... there used to be a couple of places there. There was the Spider Web and Beasley's Restaurant where they had jams, too. There also used to be a country western music place over on Locust." Pete Bridgewater on the North First Street music scene. Quoted in "A Tradition Continues," News-Gazette, January 4, 1991. "After Count Demon's band broke up, Count and Joe Bradley remained in Champaign for a while, while Waymon "Punchy" Atkinson joined Wes Montgomery for a nationwide tour before eventually returning to his hometown of Akron, Ohio. Count opened The Star Record Shop on First Street, but continued to play with local bands, which included several years of playing and singing with my group, The Tony Zamora Jazz Members," Tony Zamora, "A Musical Journey," written for the Jazz Threads celebration, 2004. "Everything was kind of centrally located. In the '60s and early '70s, you had the Elks Lodge on Chester Street, next to what used to be the Chances. They had a bandstand there and that's where I did most of my performing with a band called the Soul Brothers. We used to go over to the Chances R. on our break and catch REO Speedwagon or One-Eyed Jacks and they'd come over and watch us when they were done. 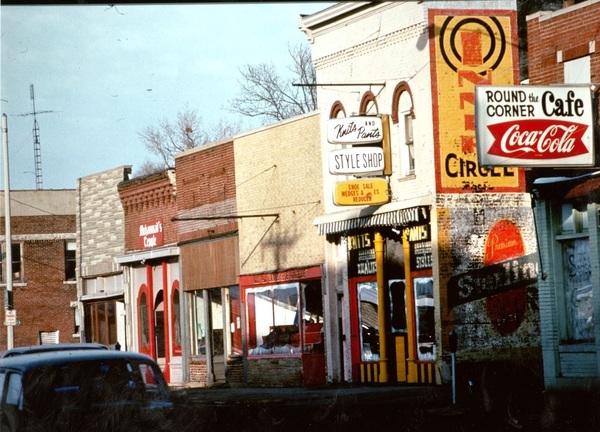 There were five or six groups that were based in town during the 1950s and 1960s. There were black bands, white bands and mixed bands that played rhythm and blues and jazz. You could throw a jam session on a slow night of the week and the place would be full of musicians who just wanted to get together to play." Gerald 'Candy' Foster on the music scene. Quoted in "A Tradition Continues," News-Gazette, January 4, 1991. "When I came here 30 years ago, First Street was the place to be. I started at a place up here called the Rainbow Tavern. Sang the blues for $7 a night. They had a barbecue place, a market. I know what First Street means to people around here, and it can be that way again...The last two years or so, people have really been trying to get that family feeling back. I hope I can help. People have wanled a comfortable, laid-back place, somewhere they can bring their wives, and that's something we haven't had in a long time." Candy Foster. Quoted in "No Blues about Neighborhood's Future," News-Gazette, August 3, 1990, when Candy's Lounge opened. "Back in the early '70s, with the gang banging, that's the thing that has been the most detrimental...When you add to that the other bad events that have happened around here, the killings at the Golden Rod (a night spot formerly on First Street), that hasn't helped." Clarence Davidson, former proprietor of Buddies', a bar and night club on North First Street, on the reputation business owners have to overcome when trying to revitalize the area. Quoted in "Jazzing it up on First Street," News-Gazette, January 4, 1991. "North First Street was a business haven for African American residents seeking to develop and provide a brighter future for their families. 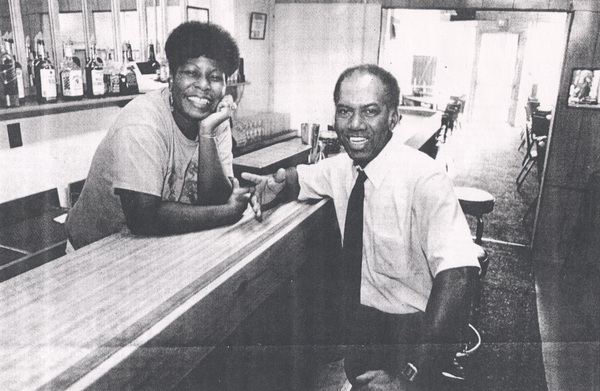 In fact, my father, Will Patterson, realized his dream of owning his own business in the late 1970s and eventually found the capital and maintained the perseverance to open the doors of Will's Open Pit Barbeque and Lounge, right next door to Knits and Pants clothing boutique, Brown's Cafe soul food restaurant and Brown's Pool Hall. All of that happened right down the street from the old Lone Star Masonic Lodge, Banks' Barbershop, Eagles Motorcycle Club, Tommy's Barbershop (which eventually became Rose and Taylor's Barbershop) and Tommy's Record Shop. When I think about civic engagement, it is rooted in this context, where the home and neighborhood serves as the backdrop for an emerging young scholar to see community activists, civic and religious leaders, pimps, players and prostitutes as well as winos and dope fiends congregating in a space that may be the corner block, neighborhood business, or back door stoop to share a meal, a conversation, or a word of inspiration with their neighbor about how to make a better world. I remember my mother taking me to Tommy's Barbershop every week to get my hair cut, in that space I received more than a haircut. It was a place where a young black boy or girl could see and hear community activists like John Lee Johnson and Roy Williams talk about issues pertaining to maintaining the spirit and pride of the black community. I remember overhearing, as the barber cut my hair, conversations about City Hall and the importance of black people being engaged in the governing process that impacted our community." William D. Patterson, Ph.D., "The Center for Civic Engagement, Social Entrepreneurship, and Research," undated proposal.